Continuing with the case study on one of the most extraordinary projects in the world created with the Solid Surface, Al Noor Island (Sharjah – United Arab Emirates), has been created by 3DELUXE with the compact mineral from PORCELANOSA Group, KRION® as the star material. Today we will focus on the Butterfly Pavilion, a challenge for 3DELUXE, taking into account that butterflies live for only a few weeks. Creating an area with ideal atmospheric conditions to provide a living space for plants and butterflies was more than a challenge. This was the basis for the complex, where a 26º biotope with ideal humidity, the location of sugar water and fruit for feeding, and the spectacular building create a perfect combination of architecture and nature, and living and inert material. 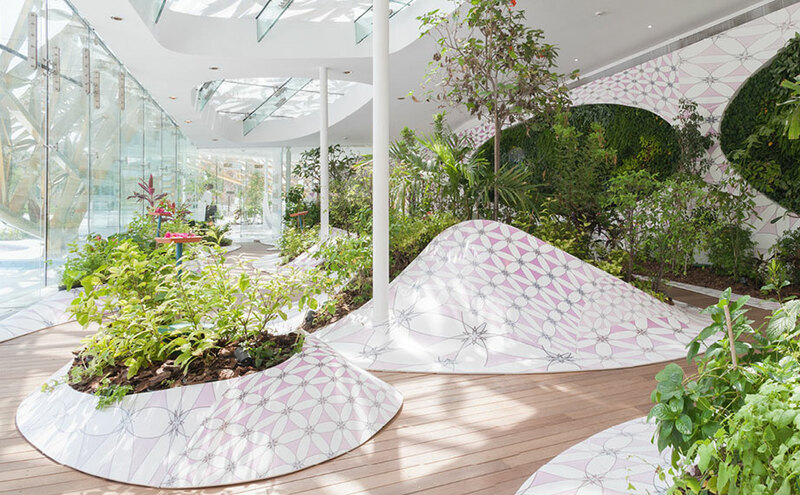 KRION® has been used by 3DELUXE within the pavilion, where man imitates what nature has provided us through a floral pattern, sublimely created with KRION® 1100 Snow White in vertical and horizontal sheets, creating a combination where nature becomes architecture.